British adventurer Sarah Outen has set out to circumnavigate the globe under her own power. The 25-year old has dubbed her expedition “London2London via the World,” and vows to complete the journey by pedaling and paddling the entire way, which means she’ll be either on her bike or rowing a boat, for every mile of the journey. 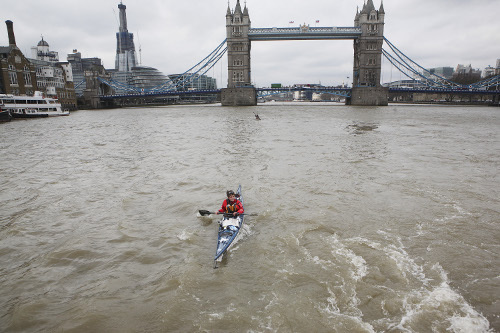 Outen set out on her round-the-world excursion last Friday, April 1st, by paddling a kayak under the London Tower Bridge. The first stage of her journey will take her down the Thames River and across the English Channel to Brussels. From there, she’ll get on her bike and pedal across Europe and Asia, a trip that will take months to complete. When she’s finished that leg, she’ll get back into a boat and paddle across the Northern Pacific to Vancouver. After that, it’s back on the bike for a short jaunt to New York City, where one final challenge will await – rowing across the North Atlantic. If all goes according to plan, she’ll be paddling back under the London Tower Bridge sometime in 2013, ending the journey where it all started. Outen is no stranger to challenging adventures. Back in 2009 she made a solo row across the Indian Ocean, becoming the first woman, and the youngest person, to accomplish that feat. She spent weeks alone at sea on the journey, which has helped to prepare her for the London2London expedition, but this latest adventure will test her in some unique and interesting ways. You can join Sarah on her journey by following along on her website and reading updates to her blog. This promises to be one amazing journey, and Outen will be a great travel guide.